However, when trying to track this badge, it doesn't show up in the selection screen! Since the game was released recently, I don't believe the tag was created much more than a month or two ago. Does a tag need to be created for a certain amount of time before it can be tracked? If not, why is the super-smash-bros-ultimate tag not appearing in the Tag Selection screen? It cannot be tracked because that tag is not eligible to have tag badges in the first place. A tag must have at least 100 questions under it in order to be eligible for tag badges. Passing the thresholds for a tag badge before the tag itself has reached its minimum questions threshold will not award you with the badge. 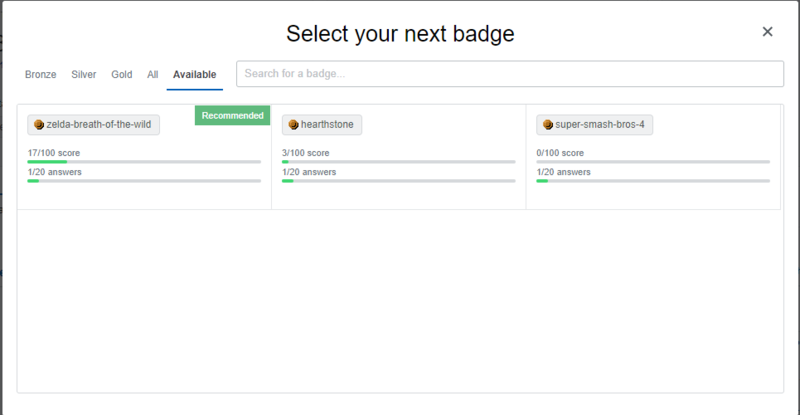 If you do pass the thresholds to be awarded, you will receive the relevant badges as soon as the tag hits 100 questions and the award process runs next. Not the answer you're looking for? Browse other questions tagged discussion tags badges profile-page badge-progress . What counts as “creating” a tag, for Taxonomist? And what prevents gaming the badge? Badge for voting tag synonyms?